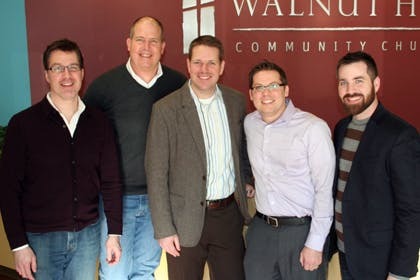 February 5, 2013 | 3:22 p.m.
Walnut Hill pastors with Bethel Seminary connections include (l to r) Tim Huber, Scott Shockley, Craig Mowrey, Adam DePasquale, and Brian Mowrey. As they seek to embody Christ to a grief-stricken community, the pastors have prayed with families who lost children, including four families from their own church, where 500 people gathered on the night of the tragedy to intercede for families, first responders, and counselors. The church established a Sandy Hook relief fund to meet community, counseling, and school needs, and also hosted author Philip Yancey, who spent time with staff members and grieving families and spoke at two public forums on “Where Is God When It Hurts?” Walnut Hill was the site of the memorial service for Dylan Hockley, one of the children killed in the shootings. Dylan’s parents “opened the service to the public and really wanted to honor their son’s short life,” says DePasquale. More than 900 people attended. 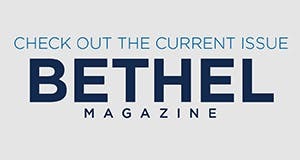 Read more of the five pastors’ stories, learn what Bethel theologians say about the tragedy, and find out how to talk to your kids about it, all in the upcoming issue of Bethel Magazine, arriving on campus and in the mail in early March.